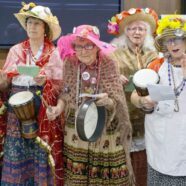 Congratulations to the Montreal Raging Grannies on a great unconvention! Ten of us attended: Bessa, Gale, Jane, Jeanette, Jo, Linda, Loris, Ria, Siobhan, and Virginia. We put on a well-received workshop on poster making in which participants made posters for the march involving all the Grannies. Our contribution to the “Show and Tell” raised the roof when we drummed in to “When the Grans Come Marching In” followed by the Corporation Song, then drumming ourselves out with “Here We Come”. We even made the front page of Le Devoir! And the great evening event was a showing of “Granny Power“, the film long in the making but worth the wait.